“I had no idea they made planes this small… it’s so cute. What a lovely scenic flight. Oh, look at Quadra and Cortez Islands way down there… so beautiful! Huh… who knew there were so many clear cuts around Campbell River?” The things that go through your mind when you are climbing to 10,000ft to jump out of an airplane might just surprise you. Skydiving was never on my list. Not my bucket list and not my maybe-I-should-one-day list. Nope. Nada. Never. I have travelled the world, climbed mountains, wandered solo for days in the wilderness, felled giant trees, and rappelled out of helicopters to fight forest fires, but I was never, ever, going to jump out of an airplane. Why? Control. Or lack of it, to be specific. The thought of tandem skydiving made me feel light-headed and gave me a pang of nausea. I was terrified to surrender control and relinquish my safety to another human being. Skydiving would mean trusting my life to a total stranger. It had been one of my biggest fears for as long as I could remember. The thing is, I don’t like anyone bossing me around, not even my own fears. What better way to release yourself from those chains than to force yourself to get up close, say hello, and even snuggle up and kiss them? It became clear to me that I would have to do it, eventually. When the sun is shining and the skies are clear, you can be sure that someone is jumping out of a plane at Pacific Airsports in Campbell River. Based at the Campbell River Airport, Roy Wharton heads up this tandem jump and skydiver training facility, which has been operating for 40 years. Some sign up to get cozy with their fears, many jump to tick off their bucket lists, and others jump for the raw hit of adrenaline that comes with hurling oneself towards the earth at 170km per hour in a onesie and goggles. 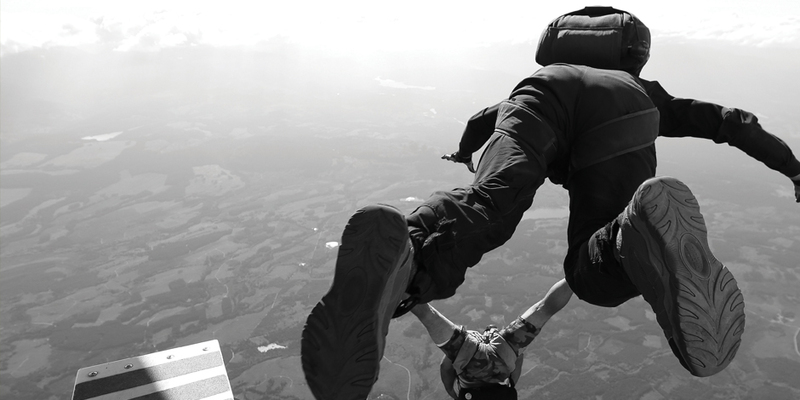 No matter the reason, jumping out of a plane transcends expectations and shape-shifts realities. You could say there is life before skydiving and life after. Getting intimate with one of my major fears in life took some sneaky mental coping strategies. That’s code for: I lied to myself and pretended I wasn’t actually going skydiving. Instead, I found myself taking a beautiful scenic flight, wedged into the back of the tiniest plane on earth, high above Campbell River, the Northern Gulf Islands, and the sparkling Salish Sea. I just happened to be wearing a flight suit, goggles and skydiving helmet, harnessed to and sitting between the legs of a man wearing a parachute. I was able to play my mind game right up until the door of the plane opened. Then, (sorry mom) sh!t got real. The power of the wind coming in through the open door broke my mental spell and I was instantly forced to face reality. I was about to skydive! My personal jump however, occurred the moment I surrendered my control, trust, and belief to the jump master and the chute packer. By the time my legs were dangling out of the plane, thousands of feet above the ground, I had already faced my biggest fear. When the jump master finally leaned forward and stood on the strut of the plane, I was ready for the ride. And out we went. But he didn’t tell me he was going to do flips! Eeeeeek! 30 seconds of free fall, dropping 5000ft, and travelling over 170km per hour, we fell towards the earth together. In those timeless free fall moments there was absolutely no fear because there is no visual reference for the brain to compute that it is actually falling towards the earth at a staggering speed. Instead, an overwhelming sense of wonder, joy, and a massive Cheshire Cat grin took over. The crew told me I was the first person they had ever heard scream as they exited the plane–from their spot on the ground 10,000ft below. “Oh! My! Gawwwwwwwwd!” I gotta be proud of those lungs.